It was a bitterly cold morning as one-by-one, we hastily arrived at Clerkenwell Road for the second annual Red Badger User Experience and Design (UXD) team away day. An opportunity for us to spend time together away from projects, getting to know each other a little more and to learn new things. Last year we went snowboarding in Milton Keynes while this year we were treated to 3D Printing in the morning; chats and quick-fire presentations over lunch and a dose of Virtual Reality in the afternoon. 3D printing has come a long way since I was first exposed to it. Studying Product Design, we were lucky enough to have 3D printer in our studio however I saw the outcome of only two models having been printed with it as the costs were prohibitive. A cup of resin back then was £1,200 which meant the team found it difficult to justify actually using it. Right now you can pick up an entire printer with filament for under £200 opening up the technology to amateurs and hobbyists, where once it was reserved for designers and manufacturers. 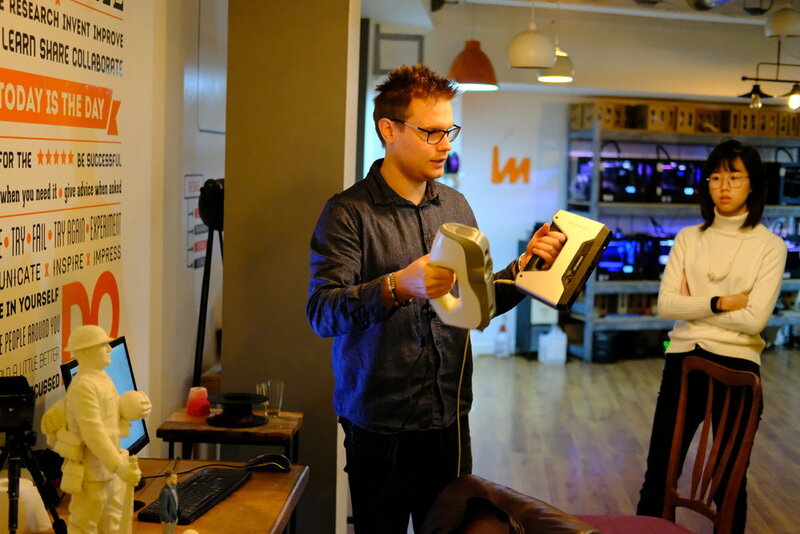 The iMakr Store in Farringdon is a 3D printer retailer who also provide 3D scanning and printing services. We started by getting up to speed on some of the concepts and terminology associated with 3D printing. As we stood around a vast table of coloured plastic, we explored models of different shapes and sizes and learned that by manufacturing with different production techniques, materials and post processing, meant a wide variety of print could be achieved. Products varied from delicate link chains to robust Thor-like hammers, lo-fi and kind of scrappy to wonderfully detailed. Commercial applications of 3D prints range through prototyping, mould making, chocolate personalisation, medical equipment manufacture, bridge building and more. 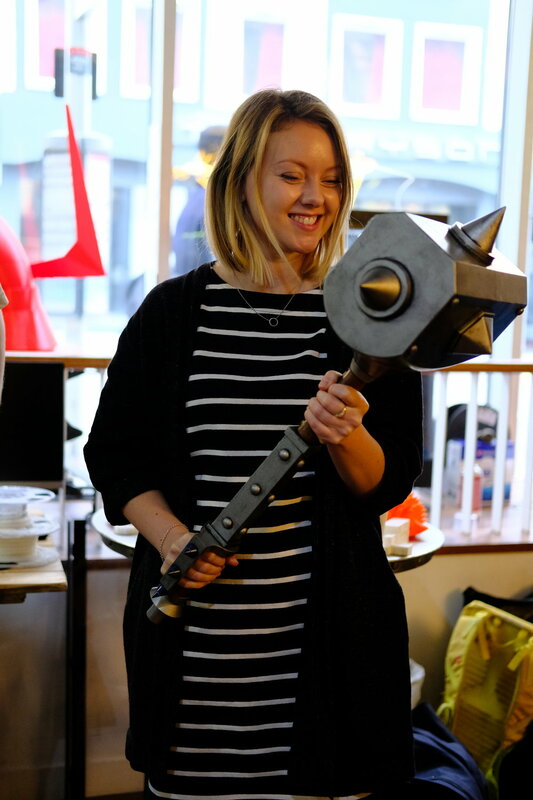 Claire with a really big hammer. Fusion 360 (think SolidWorks) and Sculptris (the lite version of ZBrush) were the tools of choice for creating the 3D models which are ultimately printed. Fusion 360 had more of an engineering bias and could effortlessly create a screw thread for example. Sculptris was more like pulling at a ball of clay, using different tools to craft a more organic model like a face - it appeared to be less accurate than Fusion 360. Once the 3D models were created they were exported to what is essentially a printer driver (eg Slic3r) which converts the 3D model into something the printer can read. We were led downstairs to the basement where iMaker have their scanning service which included handheld and desktop scanners. We were shown a handheld scanner which uses triangulation to form a digital representation of the object it scans. Using a laser emitter to emit a dot which is then measured by a camera, the camera can record where the dot is in its field of view. Demonstration of handheld 3D scanners. Shiny or dark surfaces are difficult to scan so talcum powder or matt white paint is used to create a more suitable surface for a more accurate digital model. To conclude our visit the team offered to make a model of our very own Sally the badger. They used a raster version of our logo and roughly traced around it to create a flat vector version. Due to the resolution of the final print it wasn’t necessary to be too detailed. The vector was scaled, extruded and sent to print. Thirty minutes later, to a chorus of ooo’s and ahh’s, Sally was ready. Thanks to all at iMakr who facilitated our super fun and informative morning. We dashed back to Old Street for some lunch (salad - I had chicken) and lightning talks. We each created a presentation about things we found challenging. The exercise was incredibly insightful. Working in a consultancy means that even though we form the UXD team, we work in a distributed way, each on our own cross functional projects and day-to-day we don’t see a whole lot of each other. These short presentations enabled us to share a little more about ourselves with the rest of the team. From Chris discussing his challenges around the concept of time to Froso describing the challenges around relocating to London from abroad. Sari using a cat to illustrate the notion of being proactive about things which challenge her. The afternoon session was given to design and production studio Wolf In Motion. Art Director Guillaume Couche and Software Engineer Charlie Fuller talked about designing for VR and AR and how we can apply design principles in the age of immersive technology. They also showed us their projects and how they work on these with their clients. At the end of the day we had the opportunity to try different VR applications which they’d built. Surprisingly to some, the concept of VR is not new. Early examples of VR appeared around 1950s and there are different examples of VR in throughout the decades up to today. A little further digging shows that the concept of immersive design can be dated even earlier to the 1800’s. Charlie describing VR through the ages. Guillaume and Charlie showed us how VR can be applied to solve client problems. They described how it’s currently being used to help globally distributed teams facilitate meetings. Participants wear a headset and they appear in a meeting room together in 3D in order to increase engagement, a practice which companies like Facebook have implemented. They also showed us an example of a training tool they created which allows the participant to learn to fly a kite. Pulling and manoeuvring the controls enabled the kite to soar through the sky, or in most cases plummet to the ground. The team assured us that those who have used the simulator and then gone on to fly a real kite have done so more confidently and successfully than those who haven't used the simulator. A question many of us had was How do you design for VR? UI and and UX patterns are not currently established for VR as the technology is still in its relative infancy. This means that designers and engineers have a great opportunity to experiment with affordances and conventions and start to lay down some foundations and patterns, much like in the early years of the web. The production of VR involves a lot of different disciplines like photography, engineering, architecture, physics, audio and filmmaking in order to achieve a successful experience. When building a VR experience, the team advised not to try design unnatural UI where the 3D world could be used instead and that it’s also important to consider flat UI if needing to create contrast against a 3D world. A flat UI can often make it clearer for the user to differentiate from the 3D world and interact with. They also explained that when we're designing for VR a 180 degree world is enough for the user to have a very good quality experience. To render 360 degree resolution would lead to a lower quality video, and as much of the 3D world would be behind the user, there would be little point. The process for building VR is one similar to building other products. Starting with sketching and storyboarding, they create simple rough mockups and 3D models by using tools like 3D StudioMax, Unity and Cinema 4D. The storyboard is then presented to a client to describe the look and feel. 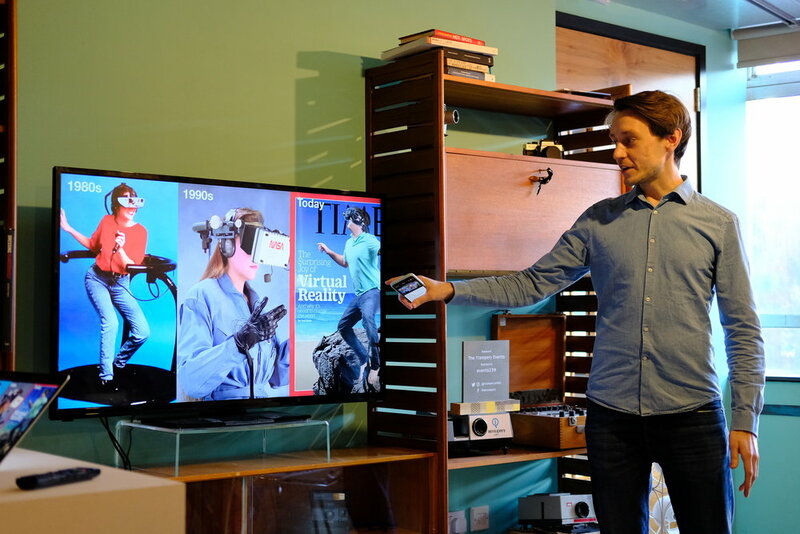 The team occasionally combines 360 degree video with 3D in order to achieve a different feel. An immersive brewery tour was used as an example of a 3D environment combined with 360 degree video, it enabled viewers to receive an introduction from the brewery owner before being immersed into the 3D world. 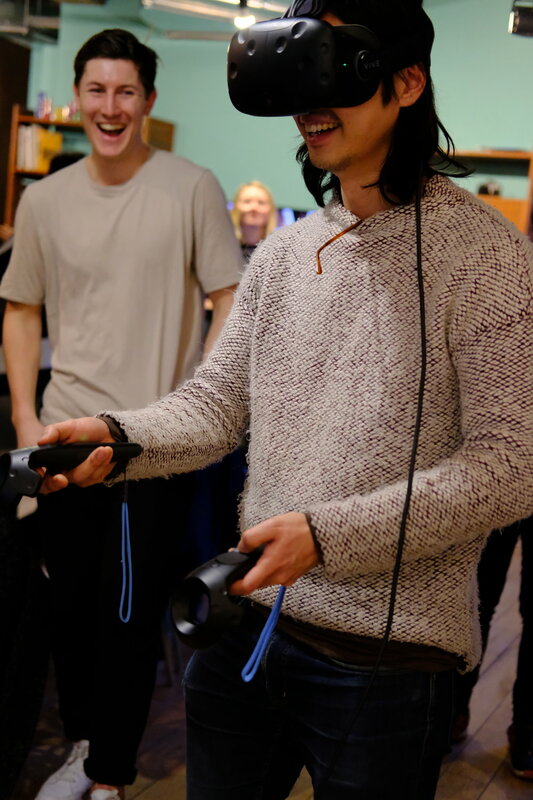 Finally we were given the opportunity to try some of the VR applications we’d learned about. It was my first time using a VR headset and I chose to fly through space using the Google Earth app. It was a great experience if slightly knee trembling at times. Others used the kite app and also experienced the brewery tour. Jun successfully remains vertical while using Google Earth. 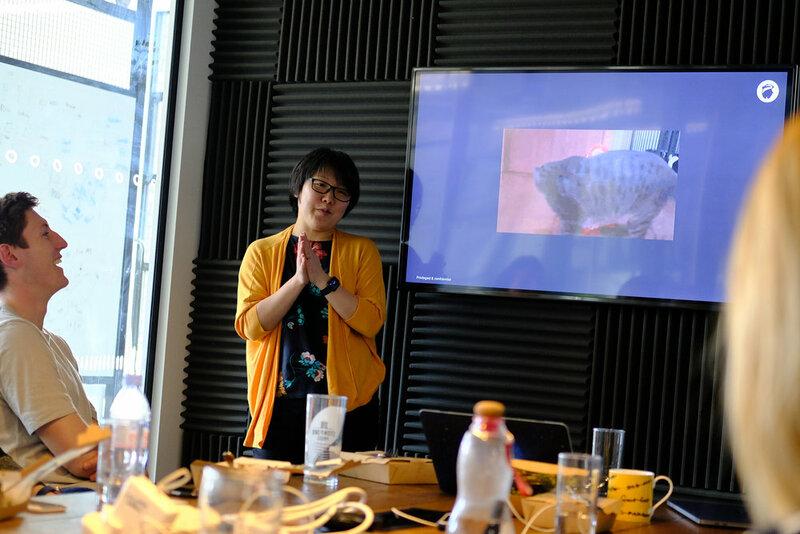 The UXD team had a really enjoyable day, learning about physical production techniques from iMakr; about each other from each other and about the application of technology for VR from Wolf In Motion. We’re already looking forward to the next one. A big thanks to Froso for her help in writing this post. Meet the Red Badger UXD team.